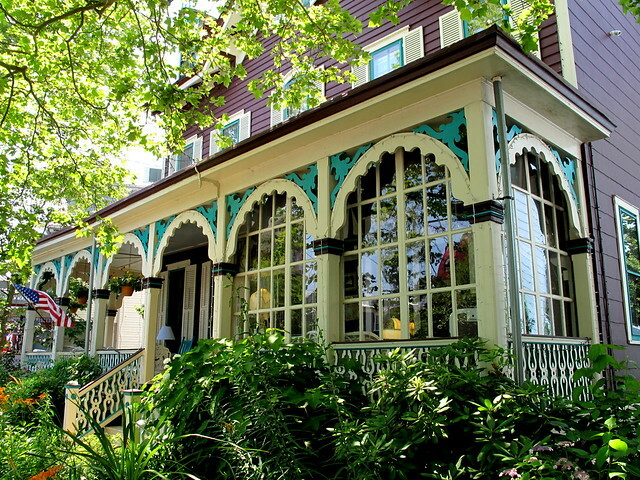 In addition to beautiful Victorians, Cape May has some pretty charming restaurants and shops. I didn’t photograph the former, because it was lunchtime and I didn’t feel like photographing people eating. Too invasive. 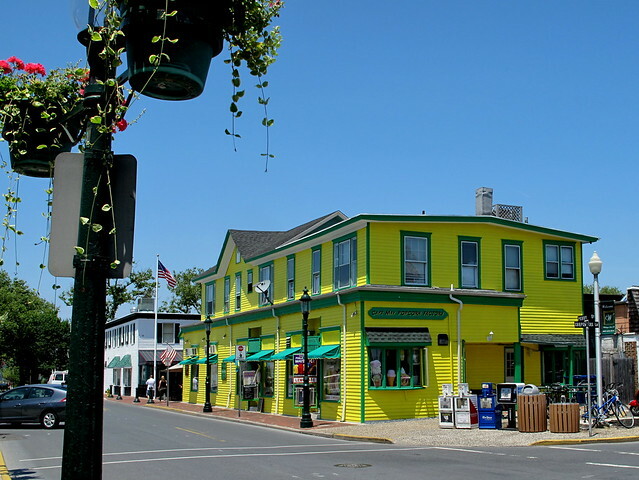 Here are two colorful shopping spots, though…. I had to de-saturate the color in this, it was so bright. Here’s another in yellow and green…. Somehow it just doesn’t go with the pastel theme of the other Victorians…. Sorry, I don’t remember what this monument commemorates. 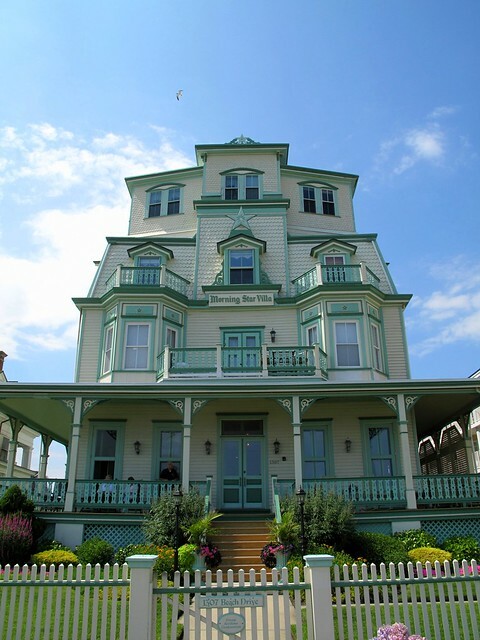 Can you believe the height on that widow’s walk next door? The ocean view must be incredible. Just can’t get over the attention to detail in Cape May. 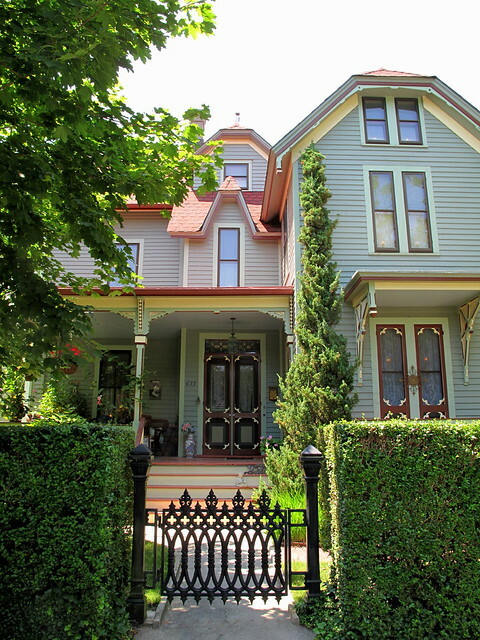 I love the way the wrought-iron gate echoes the design in the gingerbread on this place. 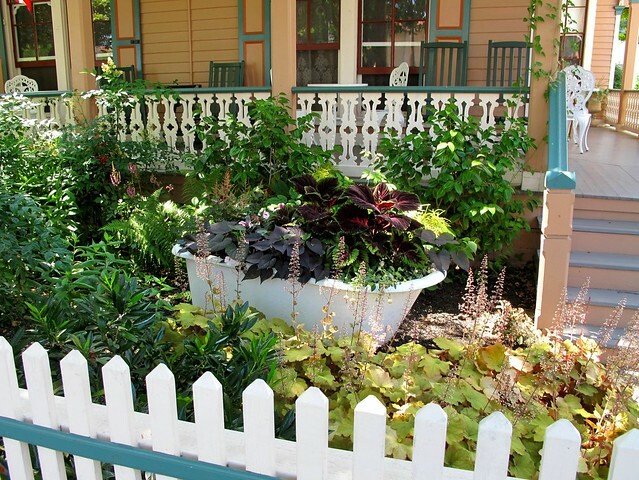 And how about this bathtub filled with coleus and flowers? The last two places face the beach. 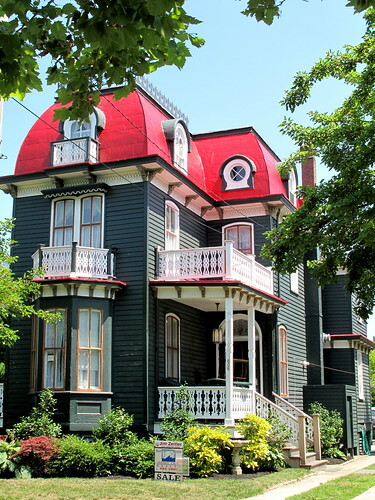 Not Victorian, but still beautiful. 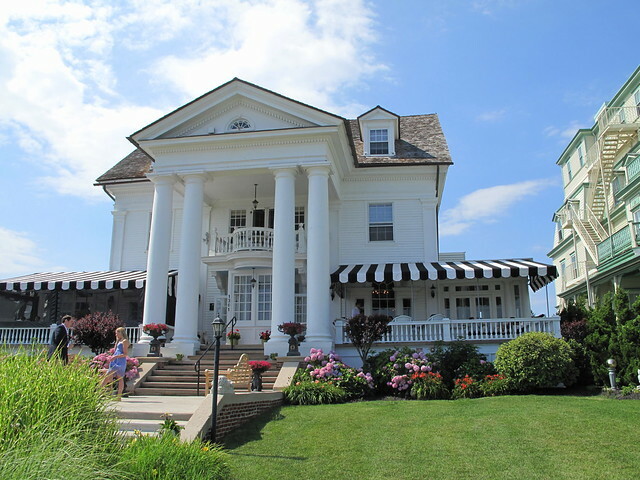 Greek Revival, I believe. It looked like a reception was going on here. I would have loved to sit on that wide verandah gazing at the ocean with a cool drink in hand. I have more shots of Cape May, but I can almost feel your eyes glazing over, so I’ll intersperse them with other stuff in the coming weeks. 🙂 I need to cut back to one photo per day for a while–it’s summer and I need to be doing other things. I want to overhaul this site and maybe use a new design. Bear with me if you see a total mess some days! How I wish I knew HTML and CSS…. 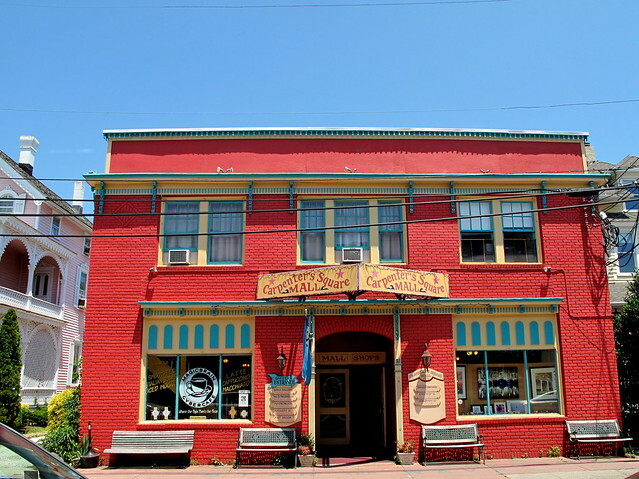 This entry was posted in photography and tagged bathtub filled with flowers, Cape May, Carpenter's Square Mall, gingerbread, New Jersey, pastel colors, Victorian-era architecture, wrought-iron gate. Bookmark the permalink. Love the photos and No, my eyes are not glazing over…please share more. I would love to have a widow’s walk to gaze out over the length of our lake and have my morning coffee up there. Just can’t seem to convince my husband that we need one. I cannot get enough of these photos. I really think they are marvelous. These house owners do have great taste, how the colors are combined and those little details like the bath tub. The black and red one is a bit harsh, at least I didn’t think the roof goes well with the rest. 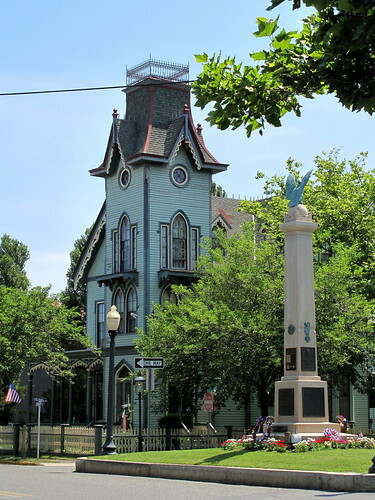 Since the city has a historical designation, all structures have to adhere to the architectural guidelines of the Victorian era, but I think paint colors must be unrestricted. It’s funny, for decades people thought Victorians were all white, then someone did research and uncovered all these incredible colors. So glad they did. 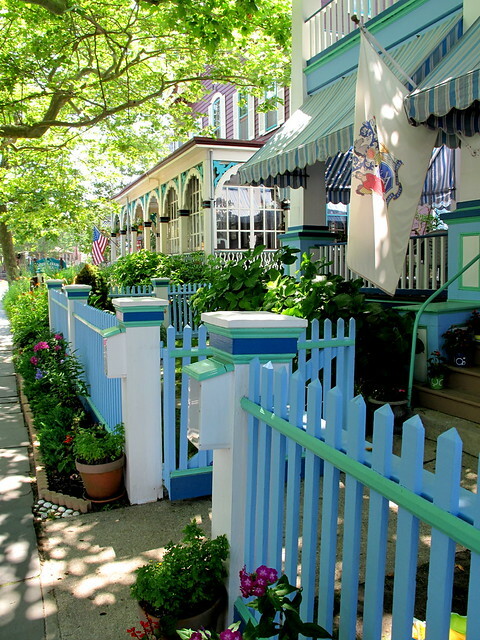 I never realized Cape May was so quaint. It looks like a charming town. I would have guessed that it’s really crowded in the summer, but from your photos, it doesn’t look overrun with tourists. Did you find that? It really wasn’t bad, Jacquelin. I think most of the people were on the beach that day because it was warm and sunny. We had no trouble getting a table at lunch, and the shops weren’t overcrowded. Wow…So colorful! Kiefer and I almost went to Cape May last summer. I guess we should go this summer. It is really beautiful. Not much going on but the beach, though. If you want a more lively place, Wildwood is supposed to be fun. Or just stay in Lewes and take the ferry like we did. So many lovely old buildings- thanks for the tour! Thanks, Slim! 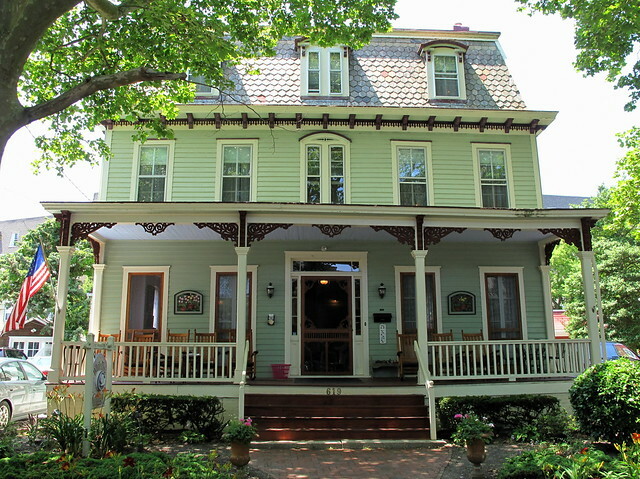 Being in Cape May is like going back in time.